Please note that we do not review websites. We always enjoy the opportunity to look at new work. 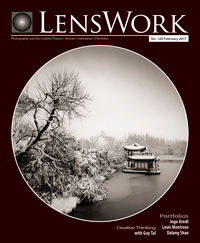 In fact, about half of what we've published in LensWork and LensWork Extended comes from submissions that were originally unsolicited, that is to say, from readers and subscribers like you. We love giving exposure to photographers who are doing good work but are not plugged-in to the publicity machines that galleries and traditional publishers provide! Ready to submit? Use this online form. Obviously, we can't publish everything that is submitted, but we also can't publish work that's never submitted! The best way to start is to send in the work and let us take a look. Thanks!